Freeman Foods was established on July 15, 1991 in Wellman, Iowa by Robert and Patricia Freeman. The building is located downtown at 268 8th Avenue. At various times in history, this building has housed a grocery store, furniture store, dentist office, and gift shop among other entities. Bob and Pat made the decision to open a business in Wellman based on the friendliness of the community, the parks and city facilities, and the outstanding school system. Bob had worked for a non-food wholesaler for many years and Pat had worked as a bookkeeper for several businesses and they were both ready to take on the challenge of their own business. One major challenge was the implication that a small town business cannot compete with larger businesses in kind and that was a number one goal - to be competitive and diverse. In 23 years, Freeman Foods has added a catering/bakery kitchen, enlarged the meat department and expanded twice to the south. The first expansion added space in the grocery dept. as well as the produce dept. The second expansion was the addition of a liquor store. “Bob's Pour House” was finished just before Thanksgiving in 2008. In September 2012, Clint and Nicole Miller purchased Freeman Foods. With 12 years of grocery experience between them, they felt confident in the decision. Their main goal is to continue the great customer service the town has become accustomed to. Freeman Foods takes part in three different pricing programs to keep their prices competitive, which is very important to their success. On May 11, 2016, Freeman Foods added a second location in North English, Iowa. The store that had been operating in North English closed it's doors on June 29, 2015. For 10 months the English Valleys community had to leave town for grocery service. Clint and Nicole saw a town with a void. 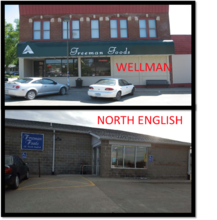 North English is a very friendly, tight knit community, much like Wellman. Clint and Nicole saw that as a positive thing and though they would fit in nicely. They decided it was time to expand the Freeman Foods brand. Services offered at Freeman Foods Locations include custom fresh meats, meat and cheese trays, bakery items, movie rentals, carpet cleaner rentals, balloons, and reverse osmosis water. Both locations have a large selection of fresh produce and a great frozen foods department. We also have a catering service in our Wellman location. Full service carry-out with your grocery purchase is provided in both locations. Services offered at Bob's Pour House include a large variety of Iowa wine, California wine, and imported wine. There is a large walk-in beer cooler and over 200 different liquors in stock. Our most recent addition is our rare liquor collection. We carry an extensive variety of hard to find bottles. Specializing in rare bourbons, we also carry rare scotch, tequila, and vodka from time to time. Pricing on these rare bottles can range from $20 to $1500. Twenty full time employees and Twenty part time employees work hard to ensure that your visit to one of our locations is a pleasant one. A large majority of our employees are locals and if they don't already know your name, they soon will. We feel strongly that a small town grocery store cannot be successful without a large amount of community support. In turn, a small community cannot be successful without the support of a local grocery store. For this reason, we try to give back in any area we can. We sponsor many events, donate to many charities, and try to stay involved as much as possible.